Often when customers are browsing for a diamond, they are not necessarily looking for a specific retailer or vendor. Instead, they are after a specific cut, carat, or quality. For most customers, this can make shopping for the perfect diamond like looking for a needle in a haystack. This is where DiamondLink comes in. 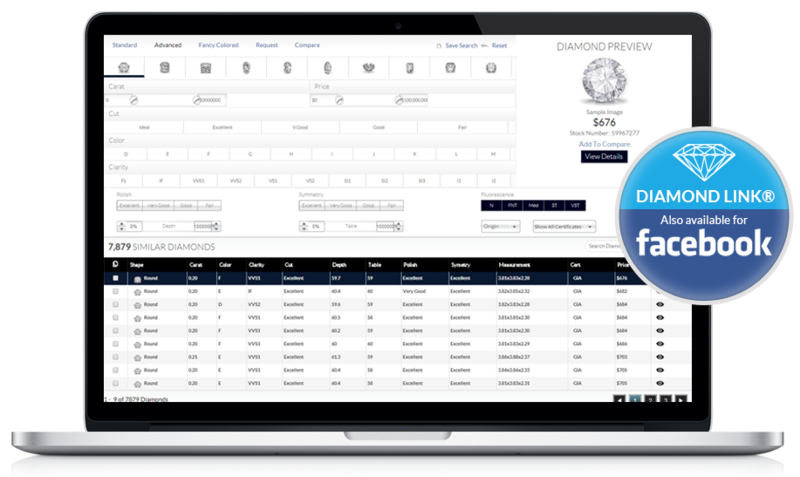 DiamondLink is a tool designed to help jewelry retailers and vendors efficiently manage their inventory online, by providing an easy way to manage mark-ups and feature diamonds from select diamond suppliers. DiamondLink is an online tool developed by GemFind, to showcase diamonds from select US diamond suppliers, on retail jewelry websites. With a simple search tool, customers can indicate the specifics of what they are looking for in a diamond. As a result, the customers can quickly connect with you on what they want, providing instant customer satisfaction. The DiamondLink also provides reports and analytics that allow you to track what customers are searching for, including cut-grade searches, certificate searches, size, and color searches. Knowing what your customers are looking for, will allow you to have a better idea of what your target audience seems to like and specifically cater your jewelry pieces to them. After adjusting the options to meet their needs, customers will see all of the available diamonds that meet those needs. GemFind is a leader in the jewelry marketing industry, helping jewelry businesses improve their digital presence and connect to potential customers. Not only does GemFind help jewelry retailers and vendors with providing online tools, but it also provides expert digital marketing and web design services, equipping you with all of the tools you need to have a successful jewelry business. Our experts are here to make your jewelry business succeed. Contact us today to get connected and to speak with one of our experts.